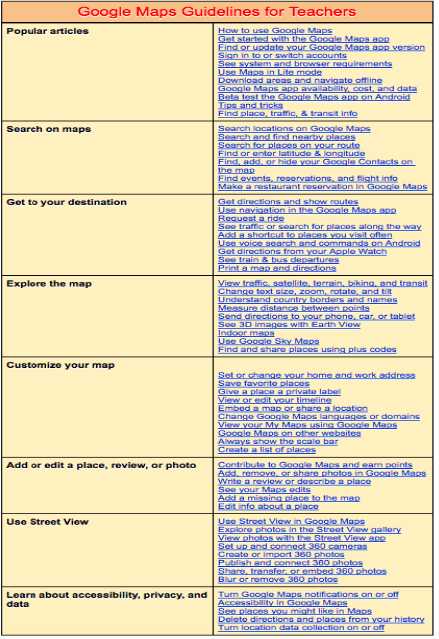 A few weeks ago we started a series of blog posts covering some of the main Google services for us in education. For each of these services we create a chart featuring the main features of the service under study. All of the features are hyperlinked leading to external pages hosted in Google Help centre where you will get to learn more about the targeted feature. Our purposes is to provide teachers, educators and students with handy resources to help them make the best of these services in their teaching, learning as well as in their professional development. 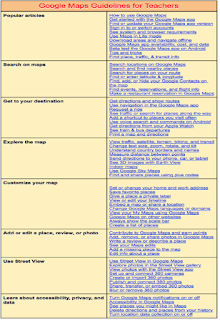 After we have covered Google Drive Chart, Chromebook chart, and YouTube chart, today's post is featuring Google Maps chart.